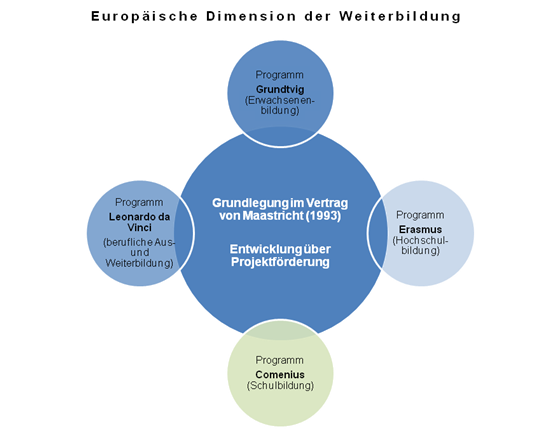 The Maastricht Treaty (Treaty on European Union, 1992) includes education and vocational training in articles 126 and 127 and defines the objectives of the European Union e.g. developing a European dimension in education through the teaching and dissemination of languages of member states, encouraging mobility of students and teachers as well as instructors and trainees, promoting cooperation between educational institutions, stimulate co-operation on training between educational or training establishments and firms, facilitate access to vocational training as well as encouraging the development of distance education (see. Fahle 2009, p. 10f; Bechtel/Lattke/Nuissl 2005, p. 36ff, Maastricht Treaty 1992, p. 29.). In the light of the EU’s rather limited educational responsibility, the individual state ministers of education and their advice are an essential forum. During the past decades, essential initiatives for the political foundation of educational programmes were formed here (see Bechtel/Lattke/Nuissl 2005, p. 33f). On the administrative level, activities in vocational training and continuing education are assembled under the umbrella of the Directorate General Education and Culture – under supervision of a general director and the responsible commissioner for education and culture in the EU. In addition, the European Centre for the Development of Vocational Training (CEDEFOP) strengthens the cooperation of the member states and the administration in Brussels with statistic activities, combined scientific findings and an active information policy.